Christmas coming means a year will end within several days, many people will want to have a new begin in the next new year from changing their figures, increase their knowledge or transform into a healthier lifestyle. Fosjoas V2 two-wheel electric self-balancing scooter can help users change their way of traveling as well as changing their lifestyle. The electric scooter is the useful tool for customers to exercise and utilizing as a kind of transport. Fosjoas V2 is the electric scooter which is designed for exercise and traveling out. It is equipped with imported Li-ion battery which is powerful and of high quality. Users do not worry about the safety problem of the battery. Besides, the fast speed charge is also another feature of the two-wheeled electric scooter, it takes only 80 minutes to get 80% of its electric quantity. This means riders do not need to wait for long time charging like other electric scooter users. Fosjoas V2 is also the first self-balancing electric scooter characterized by LED atmosphere lights. The lights can remind pedestrians and vehicles around the riders when they travel with Fosjoas V2 at night. Fosjoas V2 is also a kind of environmentally-friendly vehicle since it does not discharge any emission or pollution. It can also solve the problem of traffic jam, the small size enables electric scooter to shuttle back and forth in crowds of vehicles without any obstacles. Users do not need to worry of being late on the way to company due to traffic jam in rush hour. 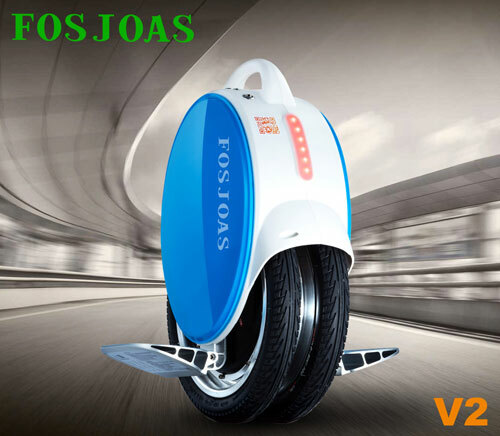 The last but not least, Fosjoas V2 twin wheel electric scooters can exercise its riders unconsciously since it needs long time standing. Users can lose weight or consume calories on the way to company. Through the electric scooter, riders will lead a healthier lifestyle since they ride instead of drive, stand rather than sit in the car. If anyone looks forward to a new life after Christmas, just ride Fosjoas V2, the electric scooter can surprise you a lot.